Today (Monday), shares of Alibaba Group Holding Ltd. (NYSE: BABA) were trading just above $67, meaning BABA stock is now below its $68 IPO price. 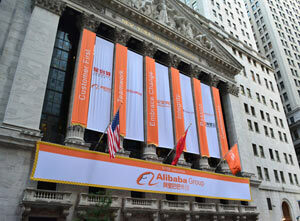 While many investors are worried about the Alibaba stock price, this is actually an excellent time to buy BABA shares. You see, Alibaba shares have been the subject of serious market overreaction. Investors around the world are worried about the Chinese economy and are selling shares of Chinese companies at an alarming rate. Shares of Alibaba's competitor JD.com (Nasdaq: JD) have performed even worse lately, down 21% in the last month. Baidu Inc. (Nasdaq: BIDU), the "Google of China," has seen its stock drop 13.3% in the last month. The "Twitter of China," Weibo Corp. (Nasdaq: WB), has posted a loss of 12.5% in August. Regardless of the company's performance, investors are selling Chinese stocks in a panic. That is especially true with Alibaba stock. In Alibaba's last earnings report on Aug. 12, the company reported an earnings beat and revenue growth of 28%. They also reported year-to-date profits of $4.97 billion, which was up 148% year to date. And those growth numbers are just one of the reasons we're bullish on Alibaba stock now. How do you save yourself from the collapse of the dollar? I know that NATO will not be able to enforce what Iran does with there supposI've nuclear power go ahead. Now, they have a means from Russia to deploy for WW3. Give me some insight pleaae.